0 Comments Published by KL Ocs Kid on Tuesday, August 7, 2007 at 8:58 AM. England coach Steve McClaren is to renew his attempts to persuade Liverpool defender Jamie Carragher not to retire from international football. 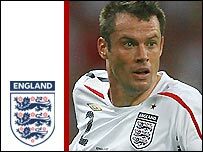 Carragher has hinted he no longer wants to play a bit-part role for England. But with John Terry, Ledley King and Jonathan Woodgate all set to miss the forthcoming friendly with Germany, McClaren wants Carragher to play on. "I've had a couple of conversations with Jamie and I'll have another with him next week," said McClaren. The England coach added: "Jamie Carragher is a very important player for England and a very important member of the squad. "There is no way I want to lose him and keeping Jamie involved is my main aim at present." Carragher was omitted from England's last game - a Euro 2008 qualifier in Estonia - and is frustrated by his status in the national team's pecking order. "I can totally understand his thought process," said McClaren. "I've every sympathy with players who want to play and feel they should. If Carragher opts to retire from international football, McClaren said he might turn to Portsmouth defender Sol Campbell. The 32-year-old defender has not featured for England since last summer's World Cup. "You can't close the door on anyone in this job," said McClaren. "It would be silly and foolish of me to dismiss either Sol or [Campbell's Portsmouth team-mate] David James. "I never said I'd do it and I've no intention of doing it. "Last season was a very good one for Sol and with Ben Foster being injured as well, I will certainly be going to watch Portsmouth. "I've brought players back in the past and as long as players want to be involved with England, that is great." Before talking to Carragher, McClaren will assess David Beckham's fitness and the standard of MLS soccer on a trip to America this week. McClaren said: "I know David has been struggling with injury and has not played yet but I intend to go over and have a chat with him to see how he is. "I also need to watch an MLS game in the flesh and have a look at the standard - I need to see it myself." McClaren will watch Washington's DC United host LA Galaxy on Thursday. Following that, McClaren will travel across England to take in four games in the opening five days of the Premier League season. Starting at West Ham on Saturday, McClaren will then head to Manchester United, Tottenham and Portsmouth. McClaren will want to cast his eye over as many players as possible before picking his squad to face Germany on 22 August.